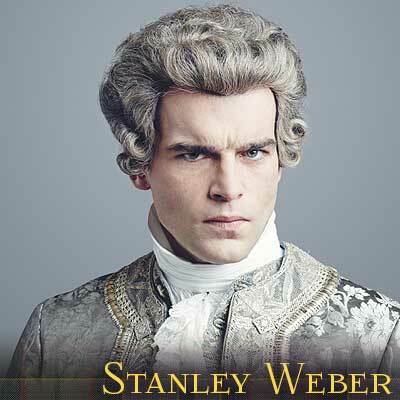 UPDATE #8: We are pleased to announce the addition of new guest STANLEY WEBER (“Comte St. Germain”). Stanley will appear on stage Friday and Saturday as well as doing autographs and photo ops both days. 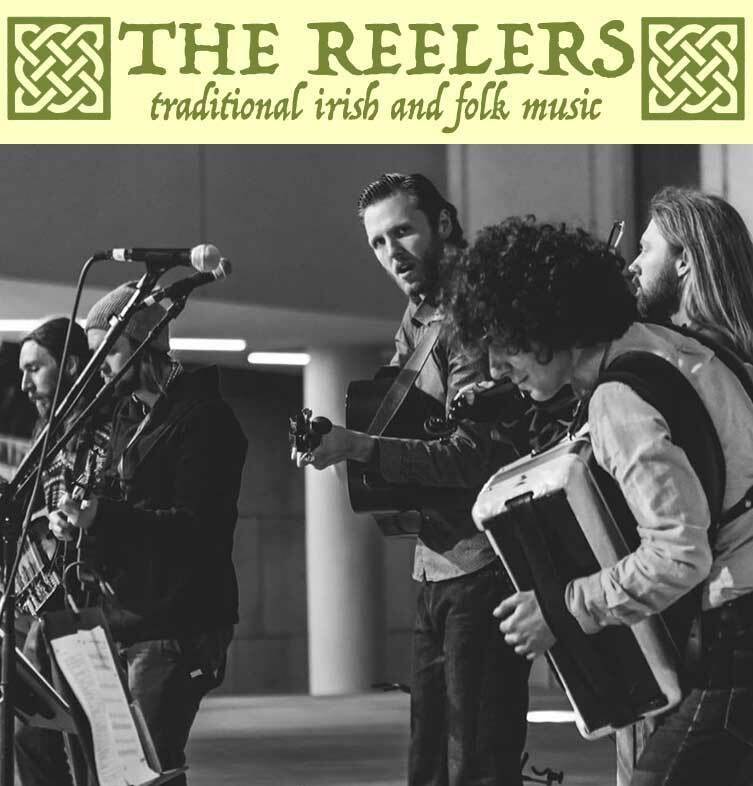 UPDATE #7: THE REELERS will be our official OUTLANDER house band for the weekend, playing as our guests take the stage. We hope you enjoy their thematic music! 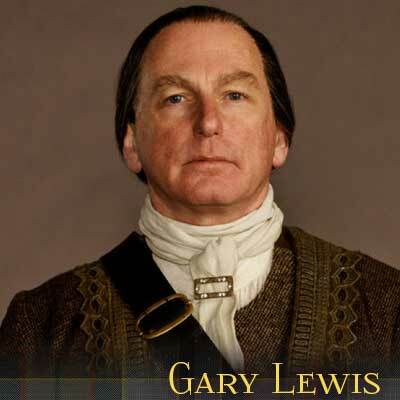 UPDATE #6: We are pleased to announce the addition of new guest GARY LEWIS (“Colum MacKenzie”). Gary will appear on stage Saturday and Sunday as well as doing autographs and photo ops both days. We’re so excited to have the head of the MacKenzie clan joining us for our event! 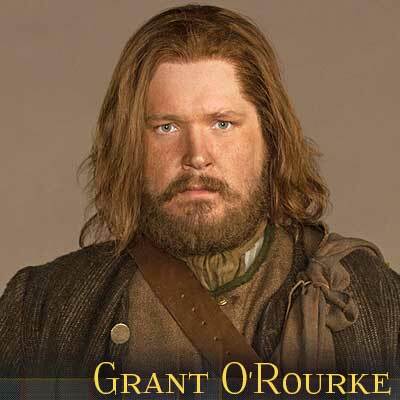 UPDATE #5: We are pleased to announce today the addition of new guest Grant O’Rourke (Rupert MacKenzie). Grant will appear on stage Saturday and Sunday as well as doing autographs and photo ops both days. He is also signing on a complimentary basis for Gold and Silver patrons. Know you’ll all have an amazing time with the rest of our fabulous cast! 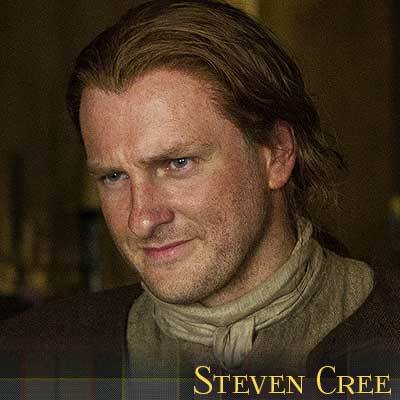 UPDATE #2: We have just signed Steven Cree (Ian Murray) to appear at the convention on Friday and Saturday. He will be participating in many of events on his days of appearance. This is the first of many guests that will be added to the show, lots of contracts out there… keep on checking back and when we have the rest we will be sending out a bulletin. UPDATE: We are currently landing new guests to be announced soon. All those that ordered separate Sam Heughan autographs, photo ops, or duo photos are having their funds for those items refunded to their credit card. Please allow the banks adequate time to process this refund. PREVIOUSLY ANNOUNCED: We have just been informed that unfortunately SAM HEUGHAN is unable to attend the convention in Las Vegas. We are currently working diligently to add new guests to fill this opening in our line-up. We regret the news of course, and we are doing our very best to bring in as many replacement stars as possible. We, as fans, truly understand how upsetting it is when a major star has to cancel. 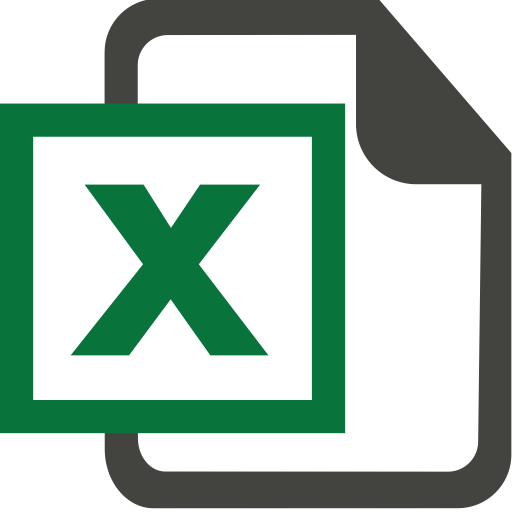 All convention agreements have to allow for guests to cancel if acting work comes up, or it would be highly unlikely there could be fan conventions at all. Also, of course, to the best of our ability, we will have a number of new guests signing on a complimentary basis in Gold and Silver packages in Sam’s place. We promise to go all out to provide a wonderful three days of live entertainment for our fellow fans. 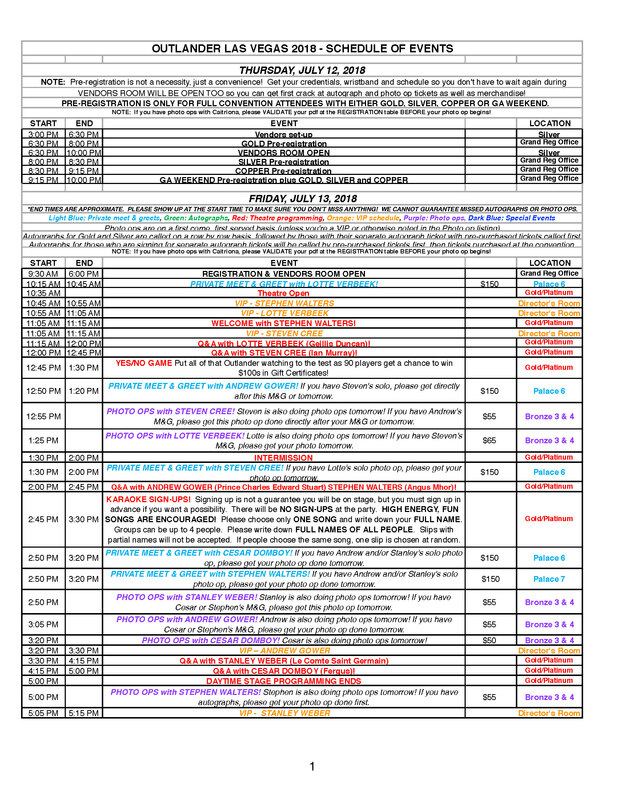 Please allow us time to put together an amazing program for you and thank you for your understanding. PRE-REGISTRATION IS ONLY FOR FULL CONVENTION ATTENDEES WITH EITHER GOLD, SILVER, COPPER OR GA WEEKEND. NOTE: If you have photo ops with Caitriona, please VALIDATE your pdf at the REGISTRATION table BEFORE your photo op begins! Outlander has become a cultural phenomenon over the years, starting with a best-selling series of novels, and then a TV show that has captured the hearts and minds of millions of viewers! The lush scenery, compelling story, and beautifully reconstructed world of the 1700's draws us in as we swoon over the epic, time-traveling romance between modern woman Claire Randall (Caitriona Balfe) and her Scottish love, Jamie Fraser (Sam Heughan)! 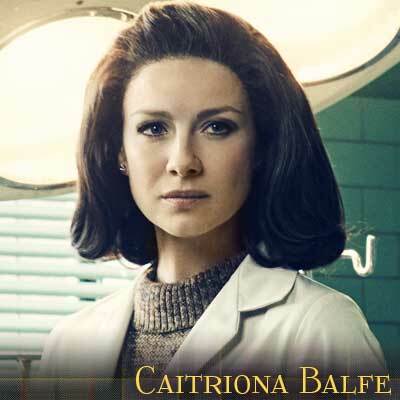 We couldn't be more excited to bring you the ultimate Outlander experience as we kick off the Official Outlander Convention in fabulous Las Vegas with our headliner Caitriona Balfe and more of the show’s amazing stars. Join us in celebrating a show that has captivated audiences across the globe, and see some of the stars in person for three days full of excitement, music and fun! STEPHEN WALTERS will host a karaoke party on Friday night like you've never seen! Come and sing your favorite songs with some of the stars of Outlander as YOUR backup singers and dancers! 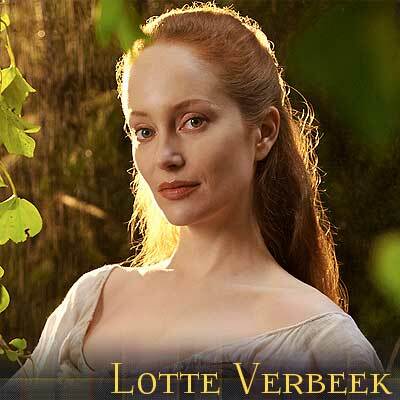 Tentatively appearing with Stephen, so far, is Lotte Verbeek, Steven Cree, Cesar Domboy, Andrew Gower and Stanley Weber. Don't worry, kilts aren't required, but we won't hold it against you if you want to wear one. Held on Friday and admission is FREE! Please note that this is a FREE EVENT, so you do not keep your same seats you had during the day. For those who want, or need, seating at the Karaoke Party, there will be seats available in the rear of the theater. STEPHEN WALTERS will host a special live concert event on Saturday Night, featuring GARY LEWIS, who will be performing, and other celebrity guests from Outlander! This concert is included in our Gold, Silver and Copper packages, and package holders keep their same seats, but tickets can also be purchased separately at the link below. As with our other genre conventions, the Saturday Night Concert is often a true highlight of your stay. The vendor area is small compared to a massive “comic con” that covers many properties, and that's how we like it. Our conventions provide a more personal experience, and that extends into the vendor area, to give the fans (and celebrities) a more rewarding show. You won't have to wade through seas of merch you aren't interested in just to find the gold because we bring only the best to our vendor area. Here’s your chance etc to get some great Outlander and other genre merchandise, often exclusive autographed items and of course our famous giant banners which make awesome souvenirs. We have one auction scheduled a day: be there for the bargains! We have multiple levels of packages and ticket options to fit any desire and every budget, and of course lower priced options will follow, but the Gold Weekend Package is our most coveted and comprehensive available. Here’s what you get when you go gold! You get in-person autographs from Caitriona Balfe, Graham McTavish, Stephen Walters, Lotte Verbeek, Steven Cree, Andrew Gower, Cesar Domboy, Sophie Skelton and Grant O'Rourke included with your Gold Package! The value of all these in person autographs is a great part of the package itself, to say nothing about having the best seats that you pick out yourself. You are in the front rows for all autograph signings included in this package! Now you'll spend less time in line, and more time enjoying the show. Unless a very rare case, autographs are done row by row with Gold going first right after our 10 VIP guests. STEPHEN WALTERS will host a special live concert event on Saturday Night, featuring GARY LEWIS, who will be performing, and other celebrity guests from Outlander! Keep your same exact seat you had throughout the day and settle in for a rousing concert-going experience! Gold gives you priority registration before any other guests! Get first dibs on exclusive merchandise and any remaining autograph or photo op tickets! Preregistration generally takes place the night before the convention starts and isn't a necessity, but can help make your weekend be as smooth as possible. It’s also fun to meet other fellow fans without having to worry about a panel or other event going on. 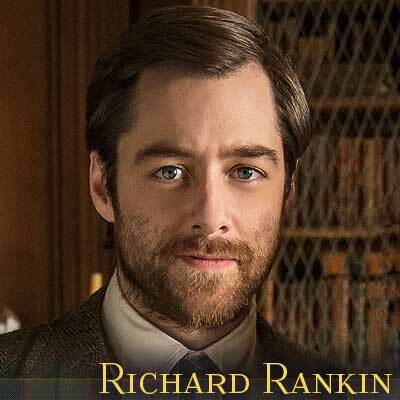 Caitriona Balfe, Sophie Skelton, and Richard Rankin plan on doing an exclusive 30-minute panel just for Gold ticket holders on Sunday where these guests will be answering questions and talking about their time on the show. This is in addition to regular convention appearances. 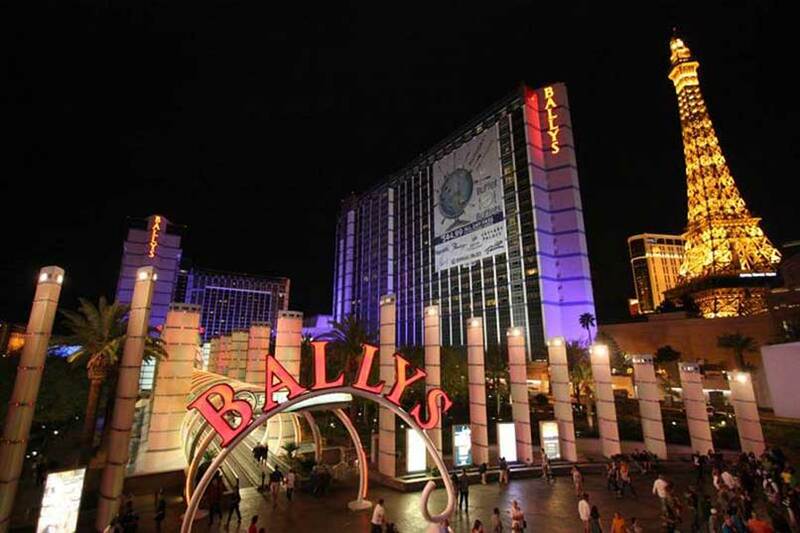 If applicable you can renew the same exact Gold seat, or try for a better one, at the following year's convention in LAS VEGAS, if applicable. This applies only to Gold Patrons! Stephen Walters hosts a karaoke party like you've never seen! 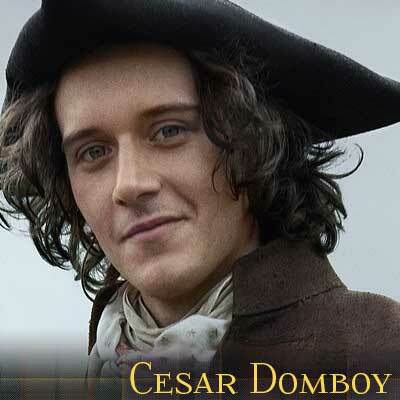 Tentatively appearing with Stephen, so far, is Lotte Verbeek, Steven Cree, Cesar Domboy and Andrew Gower. This event is general admission and standing-room-only, but we will have seats available for those who need them. Gold Patrons, if they come during pre-registration, will get first chance at the souvenirs and other goodies. Please note that this is an early bird price and may rise at any time. *Please note that if you have auto	graphs as part of your ticket package benefits you will need to have something for the celebrities to sign. They will sign anything you bring from home and there is a wide assortment of photos and other collectibles on sale at the convention. 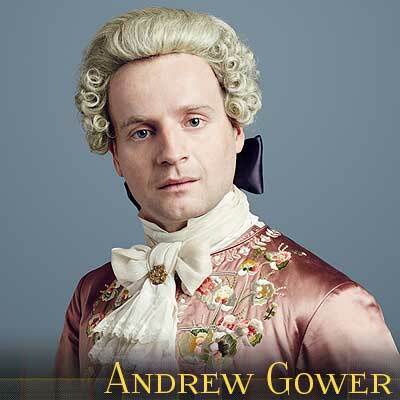 You get in-person autographs from Caitriona Balfe, Steven Cree, Lotte Verbeek, Cesar Domboy, Graham McTavish, Andrew Gower and Grant O’Rourke included with your Silver Package! We try to keep the wait for autographs as pleasant as possible, often called row by row so folks can relax without standing for a long time during star signings. At the time of this writing, it is quite possible that the autographs for our stars will be split between Saturday and Sunday and if so, Silver patrons will be advised when their signings for the two stars will be as we get closer to the convention. The cost of autographs with these stars, if bought separately, is a large portion of the cost of the package so you know SILVER is a great deal. Day of signings will of course be announced. Silver gets you early registration before any other guests (except for 10 VIPs and Gold Folks, pending upon your arrival)! We usually have a pre-registration session the night before the convention begins and also on the morning of the first day where package holders can get their tickets processed before others, going in order with Gold Patrons first, then Silver, etc. 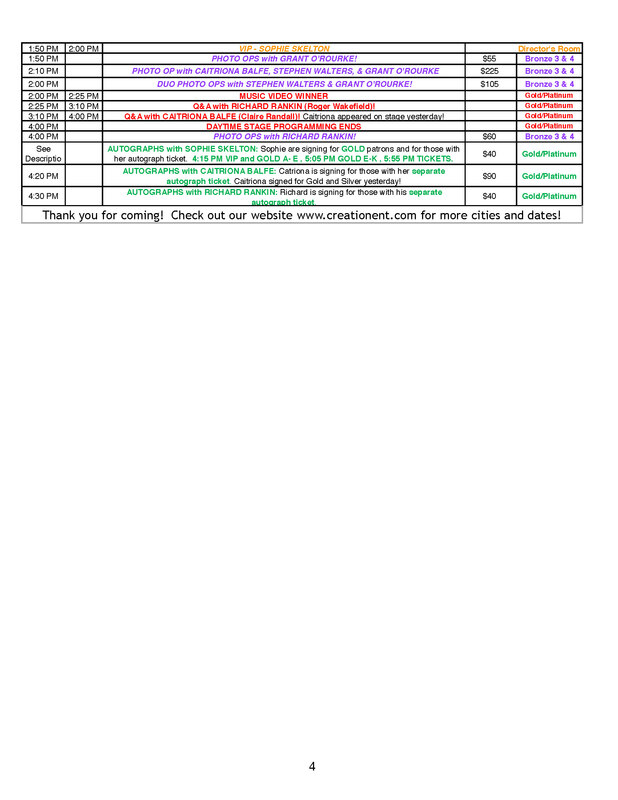 Times are posted prior to the convention usually on the Wednesday before each event. Pre-registration is a convenience, not a necessity, but the vendors room is open during pre-registration so you can get an early crack at any merchandise or stlll available autograph or photo op tickets. 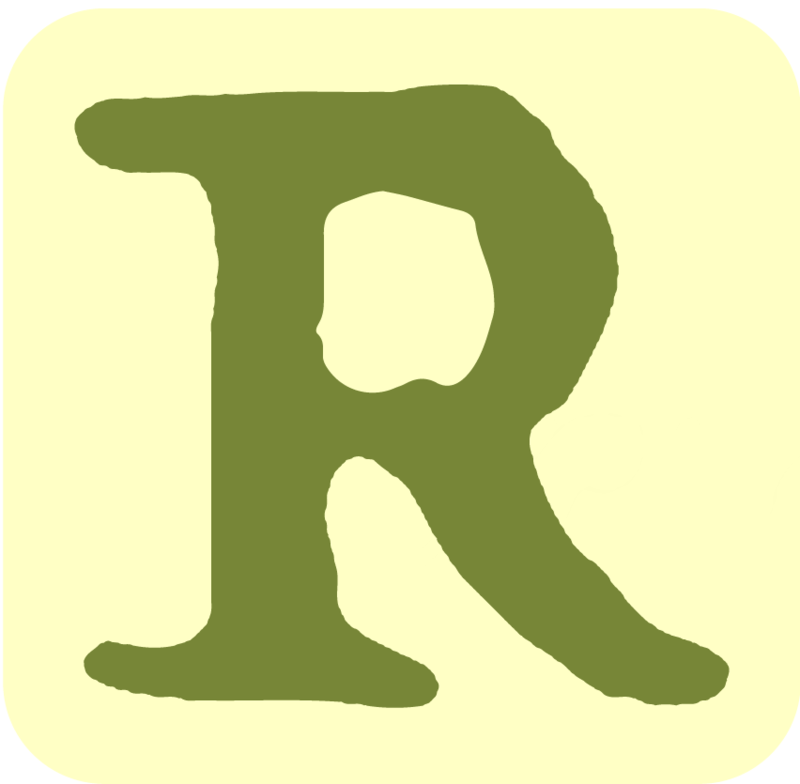 Pre-registration helps make the convention go much smoother and is a great way to meet friends without having to worry about a program event going on. You’ll have access to the merchandise available at the convention, enjoy! Silver Packages do not include the special 30 minute Gold Patrons Exclusive panel on Sunday. Those celebrities will appear also for the whole audience during the day. ADMISSION TICKET PACKAGES DO NOT INCLUDE PHOTO OPS!!! These must be purchased separately below or at the convention (if not sold out). Thanks! 2) You can choose your actual seat off of the seating chart and this seat will be yours for the entire convention (unless otherwise noted). 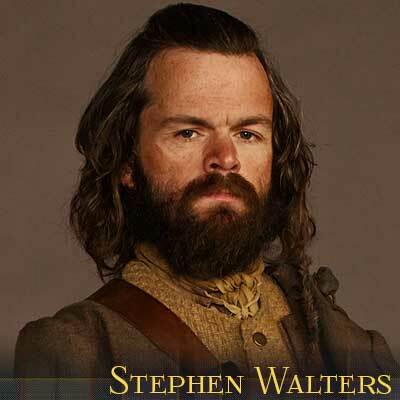 5) STEPHEN WALTERS will host a special live concert event on Saturday Night, featuring GARY LEWIS, who will be performing, and other celebrity guests from Outlander! Keep your same exact seat you had throughout the day and settle in for a rousing concert-going experience! 6) Complimentary Admission to our FRIDAY NIGHT KARAOKE PARTY please note that seats are removed from the front area for this event, so there is no reserved seating. There will be chairs in the back for those who’d like to sit back and relax. 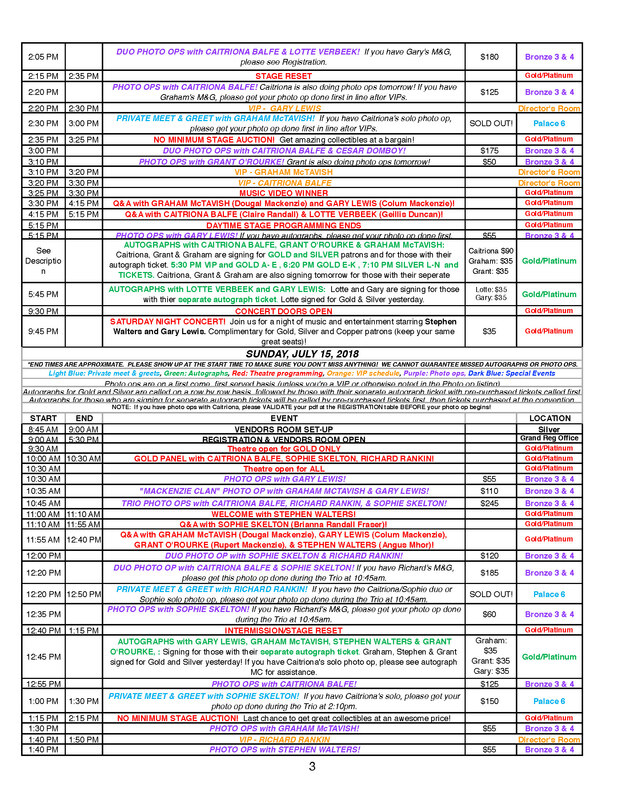 Here is the best way to attend any single day(s) of the convention. You get a reserved seat, yours to come and go all day, in the main theatre where you will see all the stars and events of the day. Of course, you also have access to the vendors room. You also get to choose your actual seat when you are ordering. This option does not include autographs and photo ops (which can be purchased separately if available), and does not include admission to the special Gold Exclusive 30 minute Sunday Panel, however all the stars appear for the entire audience. Single day tickets(s) do not include autographs, photo ops or the Gold Exclusive panel(s). 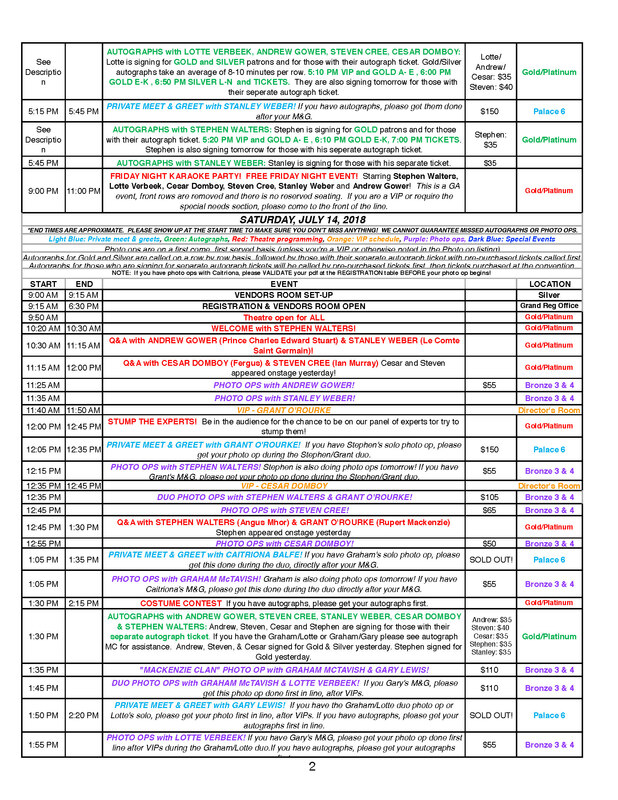 Here's the most economical way to attend any single day(s) of the convention, which is sure to be a sellout, so NOW is the time to make your plans! These tickets do guarantee a seat in the theatre and you will see all daytime celebrities and events. Of course, you also have access to the vendors room. These tickets do not include autographs or photo ops (which you can purchase if still available) or the special Gold Exclusive Panel 30 minute panel on Sunday, but those stars appear for everyone at another time during the day. 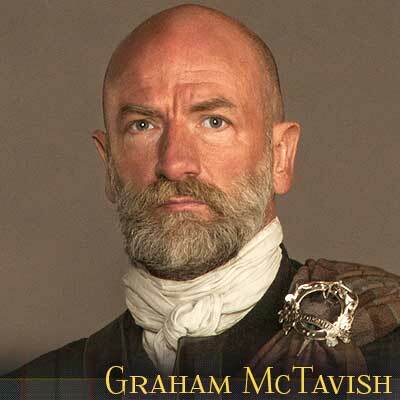 Please note that Graham will be signing on a complimentary basis for those patrons who have bought packages that include his autograph as well as separate autograph tickets on Saturday. On Sunday, Graham will only be signing for those with his separate tickets. 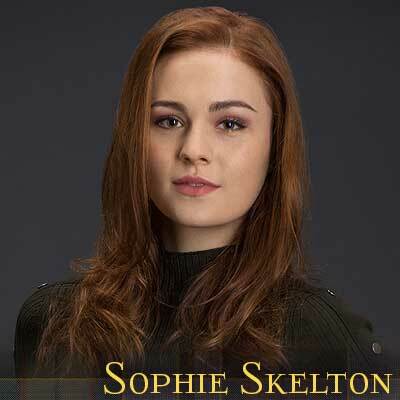 Sophie wil be signing for appropriate packages that include her autograph, plus for those with her separate autograph ticket available here, now, or at the show if still available. *Plus a daily resort fee of $30.00 per room, per night. This fee includes: Unlimited local phone calls, 2 guest admissions per day to the Fitness Center, In-room internet access to 2 devices per day. 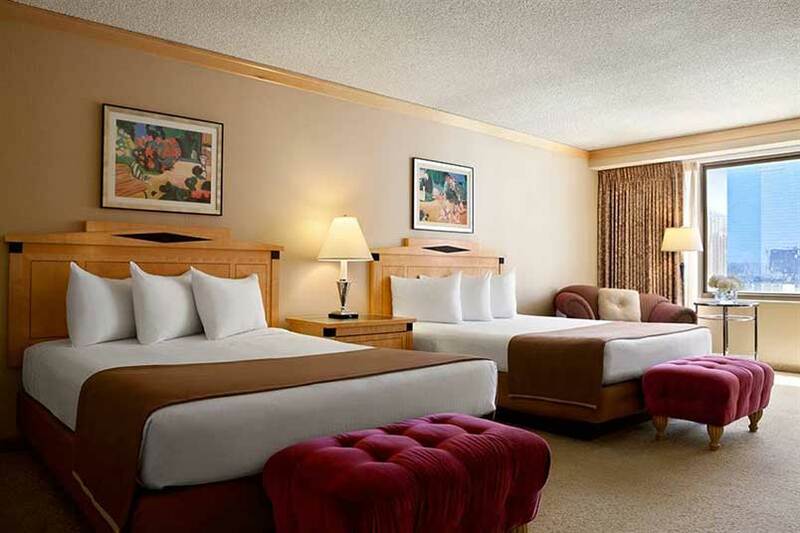 Guests may call the Reservation Center at 800-358-8777 to book rooms. 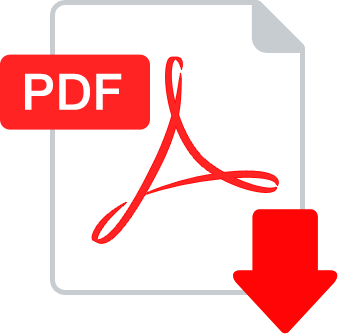 However, be aware that a $15.00 processing fee per reservation will be incurred if you choose to call in rather than use the web link. Group is listed as Outlander 2018. Callers may also use your group code: SBOUT8. ALL GUESTS are contracted to appear and all convention contracts specify that appearances are tentative and subject to change as film and television work demands take precedence as can a personal conflict. Our events will take place whether a specific guest cancels or not (we always try to book replacements) and therefore we cannot issue admission ticket or ticket package refunds if a particular guest does not fulfill their appearance contract. 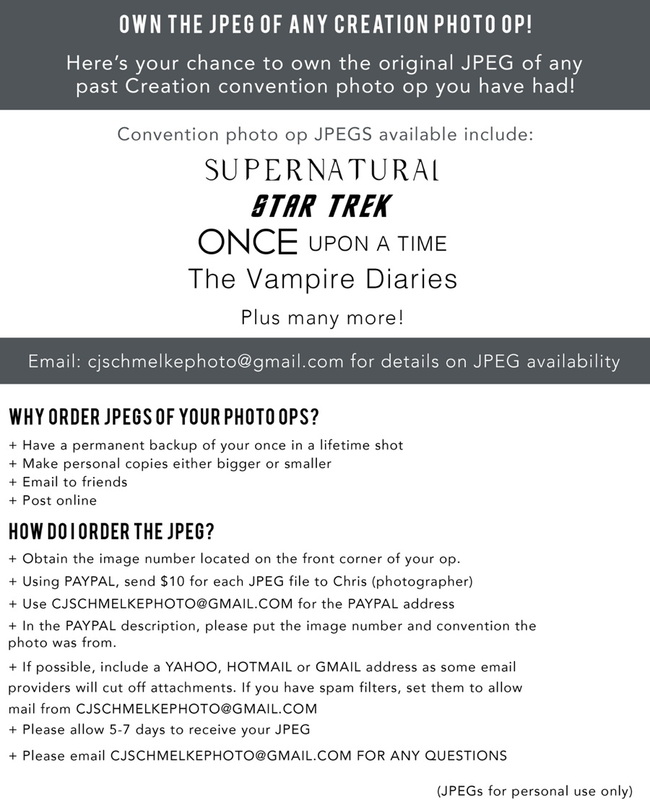 Of course, we will always refund separately purchased photo ops and autograph tickets for a guest if they cancel.